Christian Writer/Reader Connection: Grasshopper or Overcomer? Moses sent 12 spies to check out the Promised Land. All of them saw the same things, but 10 came back with a bad report, while Caleb and Joshua gave a favorable report. Ten concurred the land flowed with milk and honey, but saw themselves as grasshoppers among the giants inhabiting the land. Joshua and Caleb gave the same report, but declared the nation well able to undertake the challenge. How do we see ourselves as writers? Do we look at the giants of few publishing slots for many authors, a small platform, weaknesses in our craft, the impact of the economy on the industry, and the emergence of new technologies? Do we allow these things to make us lose heart and quit? 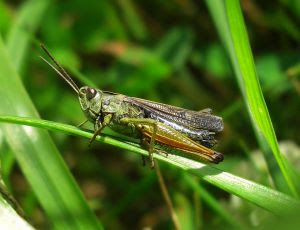 Are we a teeny, tiny speck on the book industry's radar--the proverbial grasshopper? Or do we have the faith and courage of Joshua and Caleb? Will we go forward, trusting God, and face the obstacles strewn across our path? I want to be known as an Overcomer. How about you? Oh, I want to do God's will, no matter the cost. I hope I am the kind that will keep going forward! I'm not sure I fall into the author-category that stands before publisher giants, but I can say I've had no few giants in life anyway. They're always bullies of the emotional sort, and would rob me of my faith were I to let them. What I know is the truth of that age-old adage: Feel the fear and do it anyway. Giants fall hard with even the smallest effort, though not always according to the timeline I've determined. I'd like to think of myself as someone like Caleb, but sometimes I do get scared by the giants. Thankfully, the Lord is gracious in strengthening me and giving me peace. My first thought was "A quitter never wins." I'm very competitive and tenacious so I guess I would be an overcomer, too? But then my second thought was what my husband keeps telling me, "Make sure your goals line up with God's will." I needed this post this morning, and I wrote it! I agree with you. The path may be difficult, but I want God's will. I've had to dig deep into scripture and soak up the examples given. It's the only way I can encourage my heart. I've heard that before, but needed the reminder. This is conference week for me. I'd appreciate everyone's prayers. While we all need to know the ins and outs of the publishing industry, focusing on the negatives can drag us down. God knows all about the obstacles, but they're a mere speck to Him. Yes, that is the critical factor. Are they my goals/my desires or has God given me this assignment? Marlene Bagnull has written an excellent book called, "Write His Answer," that deals with this issue. Definitely want the title of Overcomer! No matter what the challenges, delays, disappointments, trials, etc., I know that the Lord will have His way with me if I'm obedient to His will and direction for my life, including my writing. So I'll sit back and enjoy the ride and the blessings and if fame and fortune should follow then it will be the "icing on the cake" blessing of all! Well, I want to be known as an overcomer, I know God sees me as an overcomer, so that settles it, right? No matter how I may FEEL. Oh, Susan. I love this post. I believe I'll take up your challenge to have the Joshua mindset. Thank you! And, by the way, I'm now following you. Happy Tuesday! Excellent point! Our emotions are an unreliable measure of truth. They change from one moment to the next. Welcome! Thanks for commenting and becoming a Follower. I post on Monday, Wednesday, and Friday. I'm a grasshopper. Good devotional! Thank you for this post. Many times I do feel like a grasshopper. If I think too much about it, and listen to too many doomsday predictors, it would be easy to quit. But I want to be an Overcomer. Because God called me to write, and God will see me through publication and best sellers, or family history to pass on to the kids. I choose overcomer, and confess to be a work in progress! Good post, thanks so much. I think we get into trouble when we look at our own abilities and the circumstances. By looking to the Lord, those things no longer seem so big. It really is our choice. We can give up, agree with the negative circumstances, or trust God. Susan, I needed this!!! If we want to be more than grasshoppers, we need to be willing to make the sacrifices and take the risks!